This period of the end of summer and the beginning of fall is my favorite time of the year. There are many reason why this cusp of change appeals to me but one of my favorites is the annual raptor migration. Fish Springs and the entire west desert, serve as a path for an incredible diversity of birds of prey as they make their was south from various points north. Their splendor and sleek appearance are a true harbinger of the changing of the seasons. I was reminded of this when I drove down to attend the recent water agreement meeting with the Governor which was held at the Border Inn. On the way down from Fish Springs, I noted seven different golden eagles. 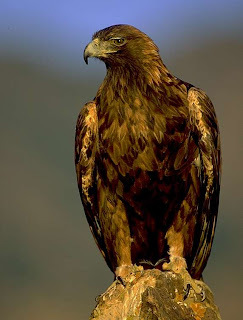 That is probably not too extraordinary in our west desert, where golden eagles are always present, but it still was an indication that young of the year fledglings and adult golden eagles are all on the move. Here on the Refuge and in my fall bird hunting haunts in the woods, I have been able to note many other species. Perhaps the highlight of the season for me was the recent experience of seeing a peregrine falcon on the Refuge trying to carry off a large duck it had killed. I could not tell for sure but I am reasonably confident it was a hen mallard and that is a pretty large duck! It was all the falcon could do to get it a few feet off the ground and fly perhaps another 50 or 60 yards distant from my passing vehicle. 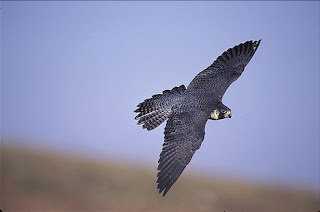 We see peregrines on a regular basis during both the spring and fall migrations and they are a reminder to me that we can indeed recover many endangered species. 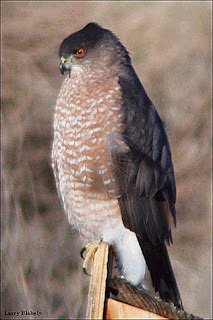 Other raptors noted on the Refuge in recent days include many sharp-shinned and Cooper's hawks. They tend to end up at the trees around the housing area or those at the Thomas Ranch Watchable Wildlife Area because being the only trees on the Refuge, that is where the song birds that provide their sustenance are. Almost every year I have been fortunate enough to see one of these beautiful accipiters take a prey bird in the housing area. It is a rare treat indeed to be witness to such nature in the raw! When I was grouse hunting recently down on Thousand Lake mountain in southern Utah, I had the good fortune to see a goshawk, the largest of our accipiters. They inhabit the aspen-pine forest regions and it is an incredible site to see such a large bird power through the timber with such agility. I have seen then in the Deep Creek Mts. in the past and even encounter some once on the trail between the Wheeler Peak and Lehman Campgrounds. 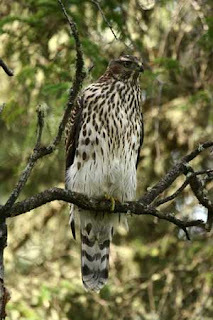 I once watched one fly to a perch and consume a ruffed grouse at the Gooseberry Campground over by Salina. They are simply spectacular raptors! Just a week ago, I noted our first rough-legged hawk of the season. These arctic nesting birds come to Fish Springs to winter and prey on our bountiful rodent populations. They are the only common buteo hawk on the Refuge for the late fall-winter period. We do see red-tailed and Swainson's hawks regularly during the migration but they do not generally winter with us. 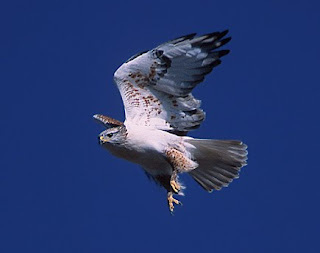 The true representative hawk of the west desert, the ferruginous hawk, is rarely found on the Refuge. They are very tied to using the desert uplands and juniper community and almost never forage on the wetlands of the Refuge. We do seen them very rarely on the Refuge uplands. Their scientific name, Buteo regalis, is well applied. 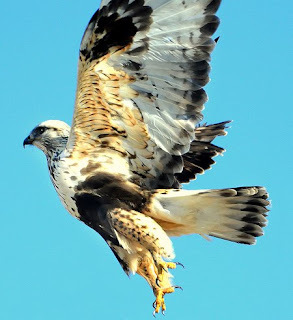 This largest of most striking of our west desert buteo hawk is indeed a regal resident! 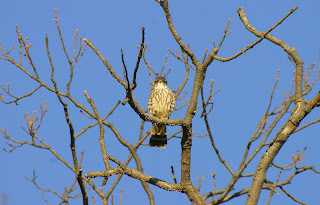 The smaller falcons, the American kestrel and the merlin are both regular visitors to Fish Springs during the migration. I always enjoy watching their often frenzied hunting behavior when they are after prey. Not much in the way of loafing time for these little dynamos. 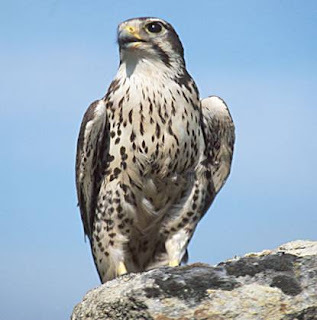 The prairie falcon, the intermediate member of our west desert falcon complement, is a year around resident on the Refuge. For the past several years, we have had prairie falcons that favored to use the top of our two-way radio tower as a perch to view the area. When I observe this in December it always brings a smile to my face and I think to myself "There is the crowning angel on my Christmas tree!" 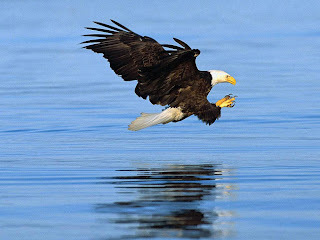 Bald eagles are perhaps the most sought after raptor by our visiting public. We only have them in the winter. On most winter days, one can find from one to as many as four or five in the trees at the Thomas Ranch site. Their number wax and wane during the winter, I think probably a function of how much winter we have. When it is mild, I think some leave to go to lakes and streams east of us to fish, their preferred foraging behavior. When winter intensifies and those areas freeze up, they come back to us to hunt waterfowl. 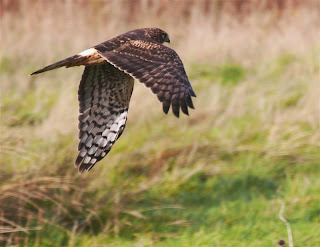 By far the most common bird of prey on the Refuge is the Northern Harrier, or for many of us, the marsh hawk. We have several pairs that nest on the Refuge and in the winter those numbers are swelled by quite a few birds that come to winter here. Their nearly ceaseless hovering and gliding about the marsh is something that can be observed any time of year and in any kind of weather. In your travels about the west desert, take a minute to appreciate the variety of birds of prey you will encounter. They come because our habitats provide the basic element that are critical to sustain them. May those habitats always continue to do so for these long distance travelers.